It must have struck him that their present situation is little better — and in some ways perhaps worse — than his own nearly a year ago. 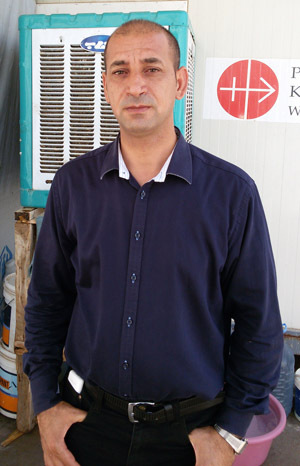 The 39-year-old priest’s witness of the squalor and frustrations that Iraqi Christians continue to face after nearly a year in the camp was relayed to Catholic News Service through fellow refugee Sahar Mansour, a Chaldean Catholic from Mosul in a July email. In such cramped conditions, Father Kthea reported that previously strong marriages are increasingly under pressure with husbands and wives “losing patience” with each other, while neighbors begin to grumble, gossip and give in to envy. Nor is there air conditioning in the caravans, leaving occupants to swelter in temperatures as high as 125 degrees. They fan themselves with anything they can find — usually a kitchen tray or a wad of paper.